The Piano Encyclopedia Blog – The Piano Learning Revolution » A 100-Day Trial! Valid until July 17th or the first 250 customers! A 100-Day Trial! Valid until July 17th or the first 250 customers! I had a crazy idea. And we are doing it. My staff thinks I’m completely out of my mind! 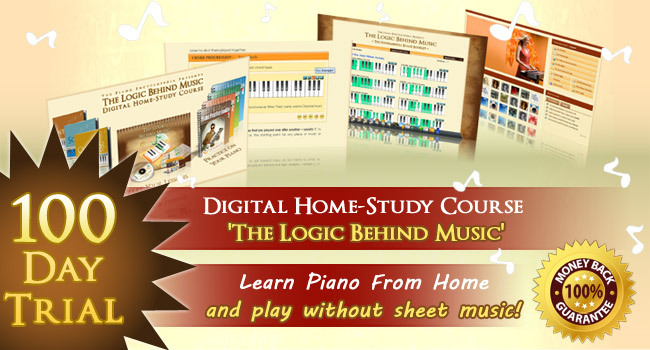 Since our Digital Home-Study Course “The Logic Behind Music” works so well for our students, how come some email subscribers have known about us for a long time, but refrain from purchasing it? What is stopping them from buying and discovering how great our course is? This means that students would really have time to test the course and see if it works for them. It would provide them enough time to learn with our system, put into practice the skills they attain, and be amazed by the results they can get from the first lessons; once they discover how much they have learned, they will want to continue with the rest of the course! Let’s sweeten the deal even more by offering something absolutely stunning: let’s add a “no questions asked” policy, so anyone can return our course for ANY reason at all. Let’s also give them a “no materials to ship back” policy, so that buyers know beforehand, that if they decide to ask for a refund they won’t have to spend time NOR money shipping ANYTHING back. Plus, as an added bonus, we’ll let them know that even if they decide to ask for a refund, we’ll let them keep part of the paid learning materials for FREE! My staff told me that I was going overboard, that we shouldn’t be this groundbreaking since they had never seen ANY company offer such a satisfaction guarantee policy. However, we truly believe in our product. Different from other companies we know with certainty that our product makes amazing changes in the musical lives of our customers. That’s why we are offering this special, even if no other company dares to do so. Our decision to make this offer is backed up by the feedback we have received from hundreds of customer’s testimonials, over the last two years. All the risk is on us – you can order with absolute confidence. However, as we have to cover the costs of production and shipping, we are offering this “100-Day Super Satisfaction Money-Back Guarantee” for just TEN DAYS (until July 17th) OR until we get to the first 250 buyers – whichever comes first. So this might be the only time you are going to be presented with such an amazing opportunity. Feel free to contact us and ask any questions you might have about our course we will be happy to answer all your questions. P.S: Remember that this special deal will last until July 17th OR until we get to the first 250 buyers – whichever comes first. Enjoy! And for all of our American subscribers, we hope you had a wonderful Independence Day this 4th of July!